Everything feels unbelievably perfect...until it doesn't. The hotel loses her reservation hours before her big interview. Serena fears that she'll have to go home without her story, but then she meets Zoe, a quirky young woman staying in the suite below Yvette’s who invites Serena to stay with her. Serena is grateful for her mysterious roommate's generosity, but it seems that there's more to her story than meets the eye. To make matters worse, soon after arriving in Cannes, Serena learns a shocking secret about her parents' marriage, and it isn't long before she begins to question her own relationship.With her deadline looming and pressure mounting, Serena will have to use her investigative journalism skills, new friendships, and a little luck to get her life and love back on track. I immediately found French Coast interesting because of the dynamic between Serena and her parents. They were very close (which was endearing) and they were obviously entirely besotted with her fiancé Chase as well-which made a cozy little family dynamic. The political link between them all was apparent and I was nervous that Serena’s own career aspirations would end up taking a backseat to Chase’s but Serena, though in love with Chase, decides she must pursue her own path and so I cheered for her from the onset. We are whisked off to Cannes for Serena to interview the infamous former editor of French Vogue and the story takes a twist in another direction. What began as Serena’s love story turns into the exploration of Yvette’s history and Serena’s old life is left on the backburner. I became much more interested in the story of Yvette than that of Serena and I think that somehow made me lose interest in the original plot. 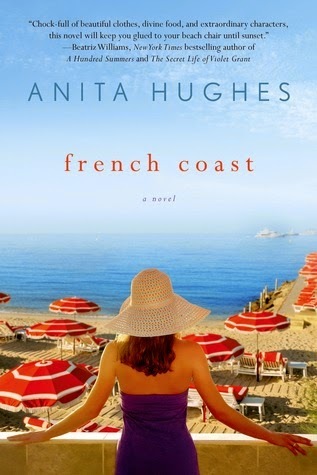 Though Yvette has her own reasons for bringing Serena to France I didn’t really find myself all that interested in that part of the novel until the end. There are a couple of things in French Coast that didn’t really work for me. I found the intimate scenes a bit repetitive and they started to come across as a bit much, as did the constant descriptions of food and fashion. I was also confused by Zoe and Serena’s rapport, as they didn’t seem to spend much time together and yet they were heavily reliant on each other? Their friendship implied a much closer bond than was established during the novel. Due to the lack of depth in the friendship between Zoe and Serena I also had a hard time getting on board with the plot line involving Zoe’s own parents.